As the 2016 San Diego Comic-Con begins, Thursday's 'Luke Cage' panel offered up a lot of information for all of Marvel's Netflix shows. Daredevil has been renewed for season three and production for the Punisher series is set to begin. New teasers for Luke Cage, Iron Fist, and the team-up Defenders were also shown. 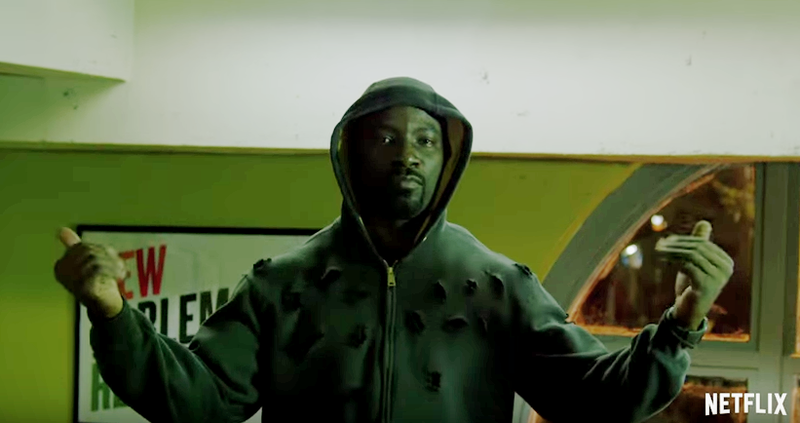 The Luke Cage teaser provided some great scenes of Mike Colter taking on armed thugs (through a hallway, where else) in a bullet-riddled hoodie while holding a car door as a shield. He's protecting Harlem from Cornell "Cottonmouth" Stokes (House of Cards Emmy nominee Mahershala Ali). Colter reprises the role that was introduced in the previous Netflix series 'Jessica Jones' where he played the love interest of Krysten Ritter's titular character. Netflix's Marvel deal includes the four series culminating in a team feature, Defenders. A short teaser with no footage but a haunting rendition of Nirvana’s "Come As You Are," with only the voiceover Scott Glenn's Stick was also teased. The other surprise was the first teaser for 2017's Iron Fist starring Finn Jones as the supernatural martial artist Danny Rand. Check out all the videos below including an interview from Marvel LIVE! with the Luke Cage cast. Luke Cage debuts on Netflix on September 30. Mahershala Ali, Simone Missick, Frank Whaley, and Theo Rossi from Marvel's Luke Cage drop by Marvel LIVE! at San Diego Comic-Con 2016!